The native form of this personal name is Erdős Pál. This article uses Western name order when mentioning individuals. Paul Erdős (Hungarian: Erdős Pál [ˈɛrdøːʃ ˈpaːl]; 26 March 1913 – 20 September 1996) was a renowned Hungarian mathematician. He was one of the most prolific mathematicians and producers of mathematical conjectures of the 20th century. He was known both for his social practice of mathematics (he engaged more than 500 collaborators) and for his eccentric lifestyle (Time magazine called him The Oddball's Oddball). He devoted his waking hours to mathematics, even into his later years—indeed, his death came only hours after he solved a geometry problem at a conference in Warsaw. Erdős pursued and proposed problems in discrete mathematics, graph theory, number theory, mathematical analysis, approximation theory, set theory, and probability theory. Much of his work centered around discrete mathematics, cracking many previously unsolved problems in the field. He championed and contributed to Ramsey theory, which studied the conditions in which order necessarily appears. Overall, his work leaned towards solving previously open problems, rather than developing or exploring new areas of mathematics. Erdős published around 1,500 mathematical papers during his lifetime, a figure that remains unsurpassed. He firmly believed mathematics to be a social activity, living an itinerant lifestyle with the sole purpose of writing mathematical papers with other mathematicians. Erdős's prolific output with co-authors prompted the creation of the Erdős number, the number of steps in the shortest path between a mathematician and Erdős in terms of co-authorships. Paul Erdős was born in Budapest, Austria-Hungary, on 26 March 1913. He was the only surviving child of Anna (née Wilhelm) and Lajos Erdős (born as Lajos Engländer). His two sisters, aged 3 and 5, both died of scarlet fever a few days before he was born. His parents were both Jewish mathematics teachers. His fascination with mathematics developed early—he was often left home by himself because his father was held captive in Siberia as an Austro-Hungarian POW during 1914–1920, causing his mother to have to work long hours to support their household. He taught himself to read through mathematics texts that his parents left around their home. By the age of four, given a person's age, he could calculate in his head how many seconds they had lived. Due to his sisters' deaths, he had a close relationship with his mother, with the two of them allegedly sharing the same bed until he left for college. Both of Erdős's parents were high school mathematics teachers, and Erdős received much of his early education from them. Erdős always remembered his parents with great affection. At 16, his father introduced him to two of his lifetime favorite subjects—infinite series and set theory. During high school, Erdős became an ardent solver of the problems proposed each month in KöMaL, the Mathematical and Physical Monthly for Secondary Schools. Erdős entered the University of Budapest at the age of 17. By the time he was 20, he had found a proof for Chebyshev's Theorem. In 1934, at the age of 21, he was awarded a doctorate in mathematics. Erdős's thesis advisor was Lipót Fejér, who was also the thesis advisor for John von Neumann, George Pólya, and Paul (Pál) Turán. Because he was a Jew, Erdős decided Hungary was dangerous and relocated to the United States. Many members of Erdős' family, including two of his aunts, two of his uncles, and his father, died in Budapest during the Holocaust. His mother survived in hiding. He was living in America and working at the Princeton Institute for Advanced Study at the time. Described by his biographer, Paul Hoffman, as "probably the most eccentric mathematician in the world," Erdős spent most of his adult life living out of a suitcase. Except for some years in the 1950s, when he was not allowed to enter the United States based on the pretense that he was a Communist sympathizer, his life was a continuous series of going from one meeting or seminar to another. During his visits, Erdős expected his hosts to lodge him, feed him, and do his laundry, along with anything else he needed, as well as arrange for him to get to his next destination. I want to be giving a lecture, finishing up an important proof on the blackboard, when someone in the audience shouts out, 'What about the general case?'. I'll turn to the audience and smile, 'I'll leave that to the next generation,' and then I'll keel over. Erdős never married and had no children. He is buried next to his mother and father in grave 17A-6-29 at Kozma Utcai Temető in Budapest. For his epitaph, he suggested "I've finally stopped getting dumber." (Hungarian: "Végre nem butulok tovább"). His life was documented in the film N Is a Number: A Portrait of Paul Erdős, made while he was still alive, and posthumously in the book The Man Who Loved Only Numbers (1998). Erdős' name contains the Hungarian letter "ő" ("o" with double acute accent), but is often incorrectly written as Erdos or Erdös either "by mistake or out of typographical necessity". Possessions meant little to Erdős; most of his belongings would fit in a suitcase, as dictated by his itinerant lifestyle. Awards and other earnings were generally donated to people in need and various worthy causes. He spent most of his life traveling between scientific conferences, universities and the homes of colleagues all over the world. He earned enough in stipends from universities as a guest lecturer, and from various mathematical awards, to fund his travels and basic needs; money left over he used to fund cash prizes for proofs of "Erdős problems" (see below). He would typically show up at a colleague's doorstep and announce "my brain is open", staying long enough to collaborate on a few papers before moving on a few days later. In many cases, he would ask the current collaborator about whom to visit next. His colleague Alfréd Rényi said, "a mathematician is a machine for turning coffee into theorems", and Erdős drank copious quantities (this quotation is often attributed incorrectly to Erdős, but Erdős himself ascribed it to Rényi). After 1971 he also took amphetamines, despite the concern of his friends, one of whom (Ron Graham) bet him $500 that he could not stop taking the drug for a month. Erdős won the bet, but complained that during his abstinence, mathematics had been set back by a month: "Before, when I looked at a piece of blank paper my mind was filled with ideas. Now all I see is a blank piece of paper." After he won the bet, he promptly resumed his amphetamine use. He had his own idiosyncratic vocabulary: although an agnostic atheist, he spoke of "The Book", a visualization of a book in which God had written down the best and most elegant proofs for mathematical theorems. Lecturing in 1985 he said, "You don't have to believe in God, but you should believe in The Book." He himself doubted the existence of God, whom he called the "Supreme Fascist" (SF). He accused SF of hiding his socks and Hungarian passports, and of keeping the most elegant mathematical proofs to Himself. When he saw a particularly beautiful mathematical proof he would exclaim, "This one's from The Book!" This later inspired a book titled Proofs from the Book. Women were "bosses" who "captured" men as "slaves" by marrying them. Divorced men were "liberated." People who stopped doing mathematics had "died," while people who died had "left." To be considered a hack was to be a "Newton". To give an oral exam to students was "to torture" them. He gave nicknames to many countries, examples being: the U.S. was "samland" (after Uncle Sam), the Soviet Union was "joedom" (after Joseph Stalin), and Israel was "isreal". In 1934, he moved to Manchester, England, to be a guest lecturer. In 1938, he accepted his first American position as a scholarship holder at Princeton University. At this time, he began to develop the habit of traveling from campus to campus. He would not stay long in one place and traveled back and forth among mathematical institutions until his death. In 1954, the United States Citizenship and Immigration Services denied Erdős, a Hungarian citizen, a re-entry visa into the United States, for reasons that have never been fully explained. Teaching at the University of Notre Dame at the time, Erdős could have chosen to remain in the country. Instead, he packed up and left, albeit requesting reconsideration from the U.S. Immigration Services at periodic intervals. Hungary at the time was under the Warsaw Pact with the Soviet Union. Although Hungary limited the freedom of its own citizens to enter and exit the country, it gave Erdős the exclusive privilege of being allowed to enter and exit the country as he pleased in 1956. The U.S. Immigration Services later granted a visa in 1963 to Erdős and he resumed including American universities in his teaching and travels. Ten years later, in 1973, the 60-year-old Erdős voluntarily left Hungary. During the last decades of his life, Erdős received at least fifteen honorary doctorates. He became a member of the scientific academies of eight countries, including the U.S. National Academy of Sciences and the UK Royal Society. Shortly before his death, he renounced his honorary degree from the University of Waterloo over what he considered to be unfair treatment of colleague Adrian Bondy. Erdős was one of the most prolific publishers of papers in mathematical history, comparable only with Leonhard Euler; Erdős published more papers, mostly in collaboration with other mathematicians, while Euler published more pages, mostly by himself. Erdős wrote around 1,525 mathematical articles in his lifetime, mostly with co-authors. He strongly believed in and practiced mathematics as a social activity, having 511 different collaborators in his lifetime. In his mathematical style, Erdős was much more of a "problem solver" than a "theory developer" (see "The Two Cultures of Mathematics" by Timothy Gowers for an in-depth discussion of the two styles, and why problem solvers are perhaps less appreciated). Joel Spencer states that "his place in the 20th-century mathematical pantheon is a matter of some controversy because he resolutely concentrated on particular theorems and conjectures throughout his illustrious career." Erdős never won the highest mathematical prize, the Fields Medal, nor did he coauthor a paper with anyone who did, a pattern that extends to other prizes. He did win the Wolf Prize, where his contribution is described as "for his numerous contributions to number theory, combinatorics, probability, set theory and mathematical analysis, and for personally stimulating mathematicians the world over". In contrast, the works of the three winners after were recognized as "outstanding", "classic", and "profound", and the three before as "fundamental" or "seminal". Of his contributions, the development of Ramsey theory and the application of the probabilistic method especially stand out. Extremal combinatorics owes to him a whole approach, derived in part from the tradition of analytic number theory. Erdős found a proof for Bertrand's postulate which proved to be far neater than Chebyshev's original one. He also discovered the first elementary proof for the prime number theorem, along with Atle Selberg. However, the circumstances leading up to the proofs, as well as publication disagreements, led to a bitter dispute between Erdős and Selberg. Erdős also contributed to fields in which he had little real interest, such as topology, where he is credited as the first person to give an example of a totally disconnected topological space that is not zero-dimensional, the Erdős space. Paul Erdős influenced many young mathematicians. In this 1985 photo taken at the University of Adelaide, Erdős explains a problem to Terence Tao—who was 10 years old at the time. Tao received the Fields Medal in 2006, and was elected a Fellow of the Royal Society in 2007. Throughout his career, Erdős would offer payments for solutions to unresolved problems. These ranged from $25 for problems that he felt were just out of the reach of the current mathematical thinking (both his and others), to several thousand dollars for problems that were both difficult to attack and mathematically significant. There are thought to be at least a thousand remaining unsolved problems, though there is no official or comprehensive list. The offers remain active despite Erdős's death; Ronald Graham is the (informal) administrator of solutions. A solver can get either an original check signed by Erdős before his death (for memento only, cannot be cashed) or a cashable check from Graham. If true, it would solve several other open problems in number theory (although one main implication of the conjecture, that the prime numbers contain arbitrarily long arithmetic progressions, has since been proved independently as the Green–Tao theorem). The payment for the solution of the problem is currently worth US $5,000. The most familiar problem with an Erdős prize is likely the Collatz conjecture, also called the 3N + 1 problem. Erdős offered $500 for a solution. Because of his prolific output, friends created the Erdős number as a tribute. An Erdős number describes a person's degree of separation from Erdős himself, based on their collaboration with him, or with another who has their own Erdős number. Erdős alone was assigned the Erdős number of 0 (for being himself), while his immediate collaborators could claim an Erdős number of 1, their collaborators have Erdős number at most 2, and so on. Approximately 200,000 mathematicians have an assigned Erdős number, and some have estimated that 90 percent of the world's active mathematicians have an Erdős number smaller than 8 (not surprising in light of the small world phenomenon). Due to collaborations with mathematicians, many scientists in fields such as physics, engineering, biology, and economics have Erdős numbers as well. Several studies have shown that leading mathematicians tend to have particularly low Erdős numbers. For example, the roughly 268,000 mathematicians with a known Erdős number have a median value of 5. In contrast, the median Erdős number of Fields Medalists is 3. As of 2015, approximately 11,000 mathematicians have an Erdős number of 2 or less. Collaboration distances will necessarily increase over long time scales, as mathematicians with low Erdős numbers die and become unavailable for collaboration. The American Mathematical Society provides a free online tool to determine the Erdős number of every mathematical author listed in the Mathematical Reviews catalogue. The Erdős number was most likely first defined by Casper Goffman, an analyst whose own Erdős number is 2. Goffman published his observations about Erdős's prolific collaboration in a 1969 article titled "And what is your Erdős number?" Jerry Grossman has written that it could be argued that Baseball Hall of Famer Hank Aaron can be considered to have an Erdős number of 1 because they both autographed the same baseball (for Carl Pomerance) when Emory University awarded them honorary degrees on the same day. Erdős numbers have also been proposed for an infant, a horse, and several actors. Erdős signed his name "Paul Erdos P.G.O.M." When he became 60, he added "L.D. ", at 65 "A.D.", at 70 "L.D." (again), and at 75 "C.D." Erdős is the subject of at least three books: two biographies (Hoffman's The Man Who Loved Only Numbers and Schechter's My Brain is Open, both published in 1998) and a 2013 children's picture book by Deborah Heiligman (The Boy Who Loved Math: The Improbable Life of Paul Erdős). ^ "Mathematics Genealogy Project". Retrieved 13 August 2012. ^ Paul Hoffman (July 8, 2013). "Paul Erdős". "Encyclopædia Britannica. ^ Michael D. Lemonick (March 29, 1999). "Paul Erdos: The Oddball's Oddball". Time Magazine. 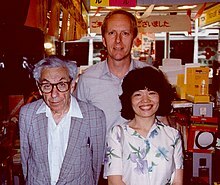 ^ "Paul Erdos | Hungarian mathematician". Britannica.com. Retrieved 2017-12-02. ^ According to "Facts about Erdös Numbers and the Collaboration Graph". , using the Mathematical Reviews data base, the next highest article count is roughly 823. ^ "Erdos biography". Gap-system.org. Archived from the original on 2011-06-07. Retrieved 2010-05-29. ^ Baker, A.; Bollobas, B. (1999). "Paul Erdős 26 March 1913 – 20 September 1996: Elected For.Mem.R.S. 1989". Biographical Memoirs of Fellows of the Royal Society. 45: 147–164. doi:10.1098/rsbm.1999.0011. ^ a b Chern, Shiing-Shen; Hirzebruch, Friedrich (2000). Wolf Prize in Mathematics. World Scientific. p. 294. ISBN 978-981-02-3945-9. ^ "Paul Erdős". Retrieved 2015-06-11. ^ Hoffman, Paul (1 July 2016). ""Paul Erdős: The Man Who Loved Only Numbers" video lecture". YouTube. The University of Manchester. Retrieved 2017-03-17. ^ László Babai. "Paul Erdős just left town". Archived from the original on 2011-06-09. ^ a b c d e f Bruno, Leonard C. (1999–2003). Math and mathematicians : the history of math discoveries around the world. Baker, Lawrence W. Detroit, Mich.: U X L. p. 120. ISBN 978-0787638139. OCLC 41497065. ^ Csicsery, George Paul (2005). N Is a Number: A Portrait of Paul Erdős. Berlin; Heidelberg: Springer Verlag. ISBN 3-540-22469-6. ^ a b c Bruno, Leonard C. (2003) . Math and mathematicians : the history of math discoveries around the world. Baker, Lawrence W. Detroit, Mich.: U X L. p. 121. ISBN 978-0787638139. OCLC 41497065. ^ a b C., Bruno, Leonard (2003) . Math and mathematicians : the history of math discoveries around the world. Baker, Lawrence W. Detroit, Mich.: U X L. p. 122. ISBN 978-0787638139. OCLC 41497065. ^ "Erdős Pál sírja - grave 17A-6-29". agt.bme.hu. Retrieved 2017-12-02. ^ The full quote is "Note the pair of long accents on the "ő," often (even in Erdos's own papers) by mistake or out of typographical necessity replaced by "ö," the more familiar German umlaut which also exists in Hungarian. ", from Paul Erdős; D. Miklós; Vera T. Sós (1996). Combinatorics, Paul Erdős is eighty. ^ Cited in at least 20 books. ^ Paul Erdős (1995). "Child Prodigies" (PDF). Mathematics Competitions. 8 (1): 7–15. Archived from the original (PDF) on 2012-03-24. Retrieved 2012-07-17. ^ Colm Mulcahy (2013-03-26). "Centenary of Mathematician Paul Erdős – Source of Bacon Number Concept". Huffington Post. Retrieved 2013-04-13. In his own words, "I'm not qualified to say whether or not God exists. I kind of doubt He does. Nevertheless, I'm always saying that the SF has this transfinite Book that contains the best proofs of all mathematical theorems, proofs that are elegant and perfect...You don't have to believe in God, but you should believe in the Book.". ^ Jack Huberman (2008). Quotable Atheist: Ammunition for Nonbelievers, Political Junkies, Gadflies, and Those Generally Hell-Bound. Nation Books. p. 107. ISBN 9781568584195. I kind of doubt He [exists]. Nevertheless, I'm always saying that the SF has this transfinite Book ... that contains the best proofs of all theorems, proofs that are elegant and perfect.... You don't have to believe in God, but you should believe in the Book. ^ Nathalie Sinclair, William Higginson, ed. (2006). Mathematics and the Aesthetic: New Approaches to an Ancient Affinity. Springer. p. 36. ISBN 9780387305264. Erdös, an atheist, named 'the Book' the place where God keeps aesthetically perfect proofs. ^ Schechter, Bruce (2000). My brain is open: The mathematical journeys of Paul Erdős. New York: Simon & Schuster. pp. 70–71. ISBN 978-0-684-85980-4. ^ Varadaraja Raman (2005). Variety in Religion And Science: Daily Reflections. iUniverse. p. 256. ISBN 9780595358403. ^ a b c Hoffman, chapter 1. As included with the New York Times review of the book. ^ "Erdos biography". School of Mathematics and Statistics, University of St Andrews, Scotland. January 2000. Retrieved 2008-11-11. ^ László Babai; Joel Spencer. "Paul Erdős (1913–1996)" (PDF). Notices of the American Mathematical Society. American Mathematical Society. 45 (1). ^ Jerry Grossman. "Publications of Paul Erdös". Retrieved 2011-02-01. ^ Charles Krauthammer (September 27, 1996). "Paul Erdos, Sweet Genius". Washington Post. p. A25. "?". ^ "The Erdős Number Project Data Files". Oakland.edu. 2009-05-29. Retrieved 2010-05-29. ^ Timothy Gowers (2000). "The Two Cultures of Mathematics" (PDF). In V. I. Arnold; Michael Atiyah; Peter D. Lax; Barry Mazur (eds.). Mathematics: Frontiers and Perspectives. American Mathematical Society. ISBN 978-0821826973. ^ "Paths to Erdős - The Erdős Number Project- Oakland University". oakland.edu. Retrieved 2017-12-02. ^ From "trails to Erdos" Archived 2015-09-24 at the Wayback Machine, by DeCastro and Grossman, in The Mathematical Intelligencer, vol. 21, no. 3 (Summer 1999), 51–63: A careful reading of Table 3 shows that although Erdos never wrote jointly with any of the 42 [Fields] medalists (a fact perhaps worthy of further contemplation)... there are many other important international awards for mathematicians. Perhaps the three most renowned...are the Rolf Nevanlinna Prize, the Wolf Prize in Mathematics, and the Leroy P. Steele Prizes. ... Again, one may wonder why KAPLANSKY is the only recipient of any of these prizes who collaborated with Paul Erdös. (After this paper was written, collaborator Lovász received the Wolf prize, making 2 in all). ^ "Wolf Foundation Mathematics Prize Page". Wolffund.org.il. Retrieved 2010-05-29. ^ Goldfeld, Dorian (2003). "The Elementary Proof of the Prime Number Theorem: an Historical Perspective". Number Theory: New York Seminar: 179–192. ^ Melvin Henriksen. "Reminiscences of Paul Erdös (1913–1996)". Mathematical Association of America. Retrieved 2008-09-01. ^ Charles Seife (5 April 2002). "Erdös's Hard-to-Win Prizes Still Draw Bounty Hunters". Science. 296 (5565): 39–40. doi:10.1126/science.296.5565.39. PMID 11935003. ^ List of collaborators of Erdős by number of joint papers Archived 2008-08-04 at the Wayback Machine, from the Erdős number project web site. ^ "From Benford to Erdös". Radio Lab. Episode 2009-10–09. 2009-09-30. Archived from the original on 2010-08-18. Retrieved 2016-02-06. ^ Jerry Grossman. "Some Famous People with Finite Erdös Numbers". Retrieved 2011-02-01. ^ De Castro, Rodrigo; Grossman, Jerrold W. (1999). "Famous trails to Paul Erdős" (PDF). The Mathematical Intelligencer. 21 (3): 51–63. CiteSeerX 10.1.1.33.6972. doi:10.1007/BF03025416. MR 1709679. Archived from the original (PDF) on 2015-09-24. Original Spanish version in Rev. Acad. Colombiana Cienc. Exact. Fís. Natur. 23 (89) 563–582, 1999, MR1744115. ^ "Facts about Erdös Numbers and the Collaboration Graph". ^ "Erdös Numbers in Finance". ^ "mathscinet/collaborationDistance". ams.org. Retrieved 2017-12-02. ^ Jerry Grossman. "Items of Interest Related to Erdös Numbers". ^ "The Extended Erdös Number Project". harveycohen.net. Retrieved 2017-12-02. ^ Paul Erdös: N is a number on YouTube, a documentary film by George Paul Csicsery, 1991. ^ Silver, Nate (12 July 2013). "Children's Books Beautiful Minds 'The Boy Who Loved Math' and 'On a Beam of Light'". New York Times. Retrieved 2014-10-29. Aigner, Martin; Günther Ziegler (2014). Proofs from THE BOOK. Berlin; New York: Springer. doi:10.1007/978-3-662-44205-0. ISBN 978-3-662-44204-3. Hoffman, Paul (1998). The Man Who Loved Only Numbers: The Story of Paul Erdős and the Search for Mathematical Truth. London: Fourth Estate Ltd. ISBN 978-1-85702-811-9. Kolata, Gina (1996-09-24). "Paul Erdos, 83, a Wayfarer In Math's Vanguard, Is Dead". New York Times. pp. A1 and B8. Retrieved 2008-09-29. Bruce Schechter (1998). My Brain is Open: The Mathematical Journeys of Paul Erdős. Simon & Schuster. ISBN 978-0-684-84635-4. Wikimedia Commons has media related to Paul Erdős. Scholia has an author profile for Paul Erdős. O'Connor, John J.; Robertson, Edmund F., "Paul Erdős", MacTutor History of Mathematics archive, University of St Andrews .